Second son of Claude Carnot. Brother of Claude-Marie Carnot-Feulins. Father of Sadi (physicist) and Hippolyte (statesman). General, statesman and scholar. Knight of Saint-Louis. Grand Officer of the Legion of Honor. Decorated with the Ordre du Lis. Member of the Institute. Comte de l’Empire and Pair de France. Known as the Organizer of the Victory or the Grand Carnot. By 1783, he was a Captain in the Royal Corps of Engineers, but was limited in his military and marital ambitions due to his modest origins. Nevertheless, he joined the French Revolution and went on to be elected Deputy of the Pas-de-Calais in the Legislative Assembly, then in the Convention where he sat with the Deputies of the Plaine. He later rejoined the Montagnards. As a member of the Committee of Public Safety (July 1793), he was in charge of military affairs and created the fourteen armies of the Republic. Sent on a mission with the Northern Army, which was led by Jourdan, he contributed to the victory of Wattignies (16 October 1793). Socially moderate, indeed even conservative, he took a stand against Robespierre, Couthon and Saint-Just during the 8 and 9 Thermidor (26-27 July 1794). Member and President of the Directory in 1795, he was removed from his position after the coup d’état of the 18 Fructidor, Year V (4 September 1797). 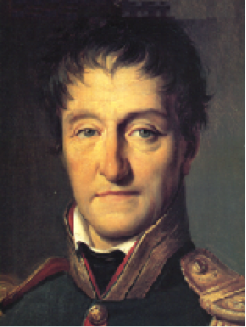 Recalled after the 18 Brumaire, Year VIII (9 November 1799), he was named Minister of War by Bonaparte. He resigned in 1800, and became a member of the Tribunate. Hostile to the Consulate and the Empire for the rest of his life, he retired from public life, dedicating himself to scientific research until 1814. He then, in his function as Governor, participated in defending Antwerp. Home Secretary during the Hundred-Days, he was banished for regicide in 1816 (Lazare voted for the death of Louis XVI and refused deferment of the sentence). He died in exile in Magdeburg. His ashes were transferred to the Pantheon on August 4, 1889 during the seven-year presidency of his grandson, Sadi Carnot. Lazare Carnot is also known for his scientific works. In his Essay on Machines in General (Essai sur les machines en général), he developed in detail the laws of collisions and set forth the law of energy conservation. With his Geometry of Position (Géométrie de position) (1803), he emerges—at the same time as Monge—as one of the founders of modern geometry. Lazare Carnot est également connu pour ses travaux scientifiques. Dans son Essai sur les machines en général, il précisa les lois du choc et énonça la loi de conservation du travail. Avec sa Géométrie de position (1803), il apparaît en même temps que Monge comme un des créateurs de la géométrie moderne.